FGo! is a simple and fast GUI front end for FlightGear, written in Python. 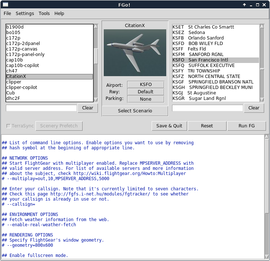 It takes a slightly different approach from any other similar application, by combining a simple graphical interface, where users can select an aircraft, airport, runway, park position and scenario, with a text window where it is possible to write more advanced command line options that will be passed to FlightGear. These features allow FGo! to keep a minimalist but powerful design. In its current state of development, the application also provides a checkbox for TerraSync, supports several languages, can manage different scenery and aircraft locations, as well as giving access to METAR data. Since version 1.5.0 it is compatible with FlightGear 3.0 and its new apt.dat database format. FGo! is available for download at the official website. A specific thread at the FlightGear forum is used for discussion about FGo! and for announcements of new releases. All information needed in order to set up and run the application can be found in the README files. The application itself also provides useful tooltips, which are viewable in the "Preferences" menu by moving the mouse cursor over the available options. The version numbers given above correspond to software versions used in the development process. It's quite likely that FGo! will work with older (or newer) versions as well, but it was not tested with them. FGo! doesn't require an installation: you can just unpack the archive anywhere and make sure that all software dependencies are met before the first start. In Debian and Debian-based distributions (e.g. Ubuntu or LinuxMint) FGo! can be installed via the official repositories: "apt-get install fgo"
For Slackware and compatible systems a SlackBuild for FGo! is available in the official repository of the SlackBuilds.org project. The included script will generate a package that allows for a clean, system-wide installation of the program. DISCLAIMER - This application is not well tested on Windows, for this reason unexpected behavior may occur. In order to use FGo! on a Windows operating system, download and install Python 2.7.8 and PIL-1.1.7: these are the needed libraries and binaries for Python. It may also be helpful to rename the "fgo" executable file, located in the main FGo! directory, to "fgo.py": otherwise Windows, unlike Linux, might not recognize it as a Python application. ↑ FGo! is compatible only with Python 2.x. ↑ This library is not mandatory to run FGo!, but is needed to display aircraft thumbnails. This page was last modified on 10 April 2019, at 11:36.